The Pleuromeiales are an interesting group of lycopsids, and were originally thought to represent an evolutionary transition from fossil arborescent forms to herbaceous, cormose forms such as extant I soetes. This hypothesis has been questioned, however, based on presumed Isoetes fossils in the Triassic (Retallack, 1997) and the discovery of cormose forms in the Paleozoic. The pleuromeialeans were smaller than the Lepidodendrales and believed to have been herbaceous or pseudoherbaceous. 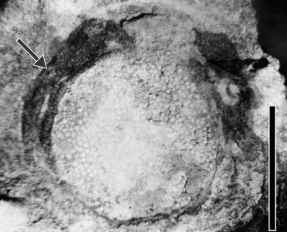 Plants with a similar growth habit have been described from the Paleozoic, for example Chaloneria (discussed below). Members of the Pleuromeiales have been included in the Lepidodendrales as well as the Isoetales, as they share features with both groups. They are generally unbranched and bear one or more terminal cones; their rooting structures are lobed, cormose, and bear stigmarian-type appendages. Some bear bisporang-iate cones, whereas only one size of spore is known from other cones. Sporangia are generally somewhat sunken into the sporophyll. Most have trilete megaspores and mono-lete microspores like the isoetaleans, although Neuberg (1960b) showed that Pleuromeia rossica contained trilete microspores (Pigg, 1992). Pleuromeia is an exclusively Triassic genus known from localities around the world, including Germany, France, Spain, Russia, China, Japan, Argentina, and Australia. The discovery of Pleuromeia at many different localities throughout the world suggests that the plant may have inhabited varying habitats. For example, numerous specimens of Pleuromeia occur in Lower Triassic beds north of Sydney, Australia, and Retallack (1975) suggested, based on a detailed analysis of the lithology of the fossil beds, that the plant grew as a coastal halophyte. Specimens from China are believed to have grown in more xeric, inland sites, perhaps near desert oases (Z.-Q.Wang and Wang, 1982), and still others from Australia in habitats that were seasonally wet (Cantrill and Webb, 1998). From the Buntsandstein (Lower Triassic) of the Eifel region in Germany, Fuchs et al. (1991) described and illustrated spectacular large slabs with numerous densely spaced P. sternbergii stems i n situ, which indicate that Pleuromeia formed extensive bitypic stands with the fern Anomopteris mougeotii. The seemingly sudden abundance of Pleuromeia in the Early Triassic is remarkable. Looy et al. (1999) suggested that the hypothesized dieback of woody vegetation at the very end of the Permian dramatically affected terrestrial ecosystems, and that lycopsids such as Pleuromeia played a central role in repopulating certain landscapes after the mass extinction. Pleuromeia has an unbranched, erect trunk, up to 2 m tall, and a four-lobed base (rhizomorph) from which helically arranged roots arise (FIG. 9.107). At the apex of P. longicau-lis is a crown of elongate ligulate leaves, each with two vascular bundles (Retallack, 1975). Slightly below the attached leaves is a zone of persistent leaf bases that grades into an area of widely separated leaf scars. Decortication stages suggest that there was some secondary tissue production in Pleuromeia, although the absence of well-preserved petrified specimens makes it impossible to determine whether these tissues were vascular or cortical in origin. Reports by Magdefrau (1931), Hirmer (1933b), and Grauvogel-Stamm (1993, 1999), among others, indicated that the axes of P. sternbergii, the type species of the genus from the Lower Triassic of Germany, were covered in leaf bases to near the base of the trunk (FIG. 9.124). This plant bore leaves of two types in a lax (subhorizontal) position. The rhizomorph is lobed and is characterized by a bilateral furrow system that divides the base typically into four lobes. The pattern of development of the rootlets appears to be like that in Isoetes . A species similar to P. sternbergii , P. obrutschewii ( FIG. 9.108), has been reported from the Lower Triassic of the Russian Far East (Krassilov and Zakharov, 1975). of pleuromeids were dispersed by water, based on their shape and their abundance in the rocks. This hypothesis parallels that of Phillips (1979) for the dispersal of megaspo-rophylls of many Carboniferous lycopsids (see section "Conclusions"). Other species of Pleuromeia are smaller (Meng, 1996). Pleuromeia jiaochengensis was ~50cm tall (Z.-Q. Wang and Wang, 1982). 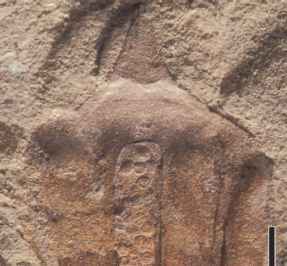 Specimens include compressions that come from the Early Triassic of Shanxi Province, China. On the unbranched stem are leaf scars to which were attached awl-shaped leaves 3 mm long. At the distal end of the stem is a large cone constructed of obovate sporophylls bearing discoid sporangia. Only megaspores are recorded, and these range up to 500 pm in diameter. Pleuromeia epicharis (FIG. 9.110) is one of the better-known species and is based on material from the Shiqianfeng Group in north China (Wang and Wang, 1990). The specimens include stems, leaves, basal parts, and micro- and megasporangiate cones (FIG. 9.111). Megaspores are of the Banksisporites type. Specimens of P. rossica were transferred to the new genus, Lycomeia (Dobruskina, 1985a). Microspores and megaspores of L. rossica reveal (ultra-)structural characteristics regarded as distinctive of the spores of Isoetales, which adds support to the hypothesis suggesting a close relationship between Pleuromeia and Isoetes (Lugardon et al., 1999, 2000). More recently, Grauvogel-Stamm and Lugardon (2004) have also demonstrated that the spores of P. sternbergii have a number of features characteristic of isoetalean spores. Some workers have included Pleuromeia longicaulis in a new genus, Cylomeia (White, 1981a). It is believed that this plant produced terminal cones of the Skilliostrobus type (FIG. 9.112 ) (Ash, 1979). 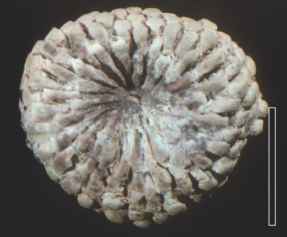 This Early Triassic, pedunculate, bisporangiate cone is known from Australia and Tasmania. It consists of helically arranged, wedge-shaped sporophylls with an adaxial groove containing obovate sporangia. The cone is up to 8 cm in diameter and only about half as long. Microspores are monolete (40 pm) and most similar to Aratrisporites, whereas the trilete megaspores range up to 1. 1 mm and are most similar to Horstisporites. Petrified Triassic stems of Chinlea from North America were initially thought to represent osmundaceous ferns, but they are now regarded as lycopsids, possibly related to Pleuromeia (Miller, 1968). The stems contain an ectophloic siphonostele with a distinct perimedullary zone of thin-walled parenchyma. Leaf traces are numerous (up to 165 in one transverse section) and collateral. Pleurocaulis rewanense is a protostelic stem with circular to oval scars that may represent a decorticated stem stage (Cantrill and Webb, 1998). Ferganodendron is a Triassic genus that resembles Pleuromeia and Sigillaria in many respects (Dobruskina, 1974). The trunk of the plant varies from 20 to 30 cm in diameter and is covered with numerous, elliptical-rhombohedral leaf bases that are helically arranged. The leaves are small and are found only on the more distal portions of the plant. Nothing is known about the internal structure or reproductive parts. The genus name Lycostrobus is used for isolated, bis-porangiate cones which are known from several Triassic deposits and thought to be allied with the Pleuromeiales, based partly on the presence of monolete microspores. The basic construction of these cones is similar to that of a bis-porangiate Flemingites with helically arranged sporophylls and adaxial sporangia. In L. scottii, the microspores occur in groups, and it has been suggested that the grouping may have been the result of sporangial trabeculae (partitions) that were not preserved. Lycostrobus chinleana, from the Triassic of Arizona, is now considered to be a member of the Equisetales (see Chapter 10). they suggest that Annalepis had a similar growth habit as Pleuromeia . Isolated lycopsid-like sporophylls from the Voltzia Sandstone (Middle Triassic) are called Bustia ludovici (FIG. 9.125) (Grauvogel-Stamm, 1991). 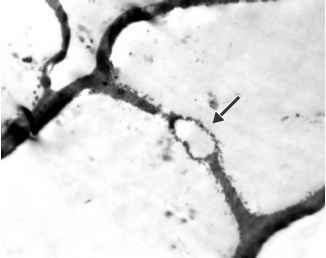 The distal lamina is narrow and up to 3.5 cm long and vascularized by two vascular bundles. Sporangia were large and characterized by internal trabeculae. Spores are of the Aulisporites type. Austrostrobus ornatum (Triassic of Argentina) is a large, structurally preserved lycopsid cone that is believed to represent a petrified Cylostrobus (Morbelli and Petriella, 1973). The two taxa differ only in the size of the megaspores, and that difference may simply represent a combination of preservational phenomena and cone development.